The term “boma” can refer to a livestock enclosure, stockade, corral, small fort, or a district government office and community used in many parts of Africa. It does seem that the feeling of the restaurant mimics a community gathering at an open air market, and you can see a lot of the design takes inspiration from this term with stick like structures and wooden fencing. The interior style incorporates bright colored fabrics and lights, natural textures like wood and stone flooring, and the buffet areas feature thatched roofing. With open kitchens and tall ceilings this restaurant feels very energetic and vibrant. The restaurant is typical of Disney World buffets. They tend to be very busy with people walking around everywhere with a constant chance of running into others. 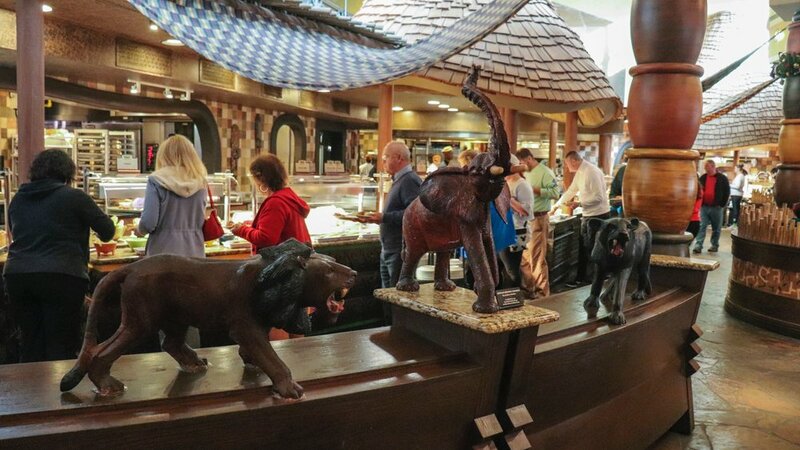 One downside to Boma is that it can get loud in the dining area as it is open to the two floors above, the second of which is the lobby of the Animal Kingdom Lodge. Luckily we did get a table closer to the windows and further from the buffet line. The host stand and entrance. 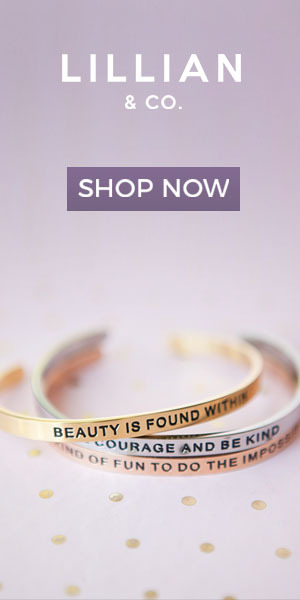 Note the organic shapes of the design elements. Thatched roofs and wildlife decor really sets the scene. 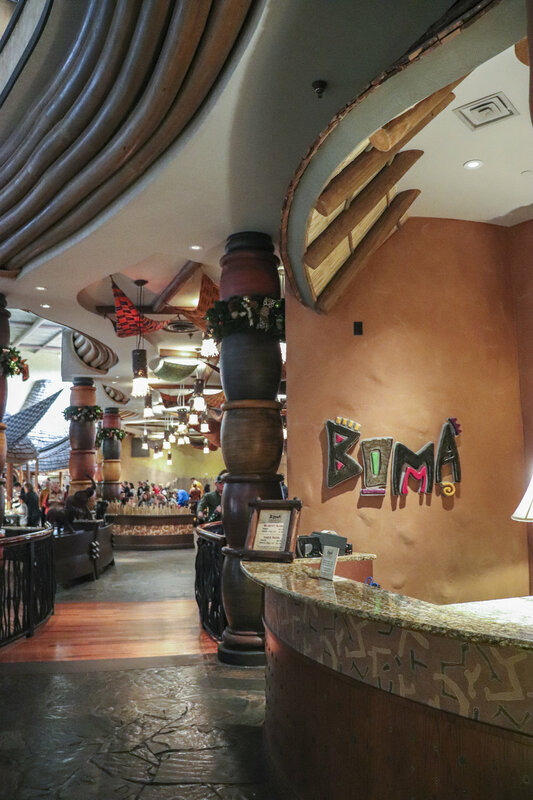 Boma features both classic American dishes as well as unique cuisine inspired by over 50 African countries. 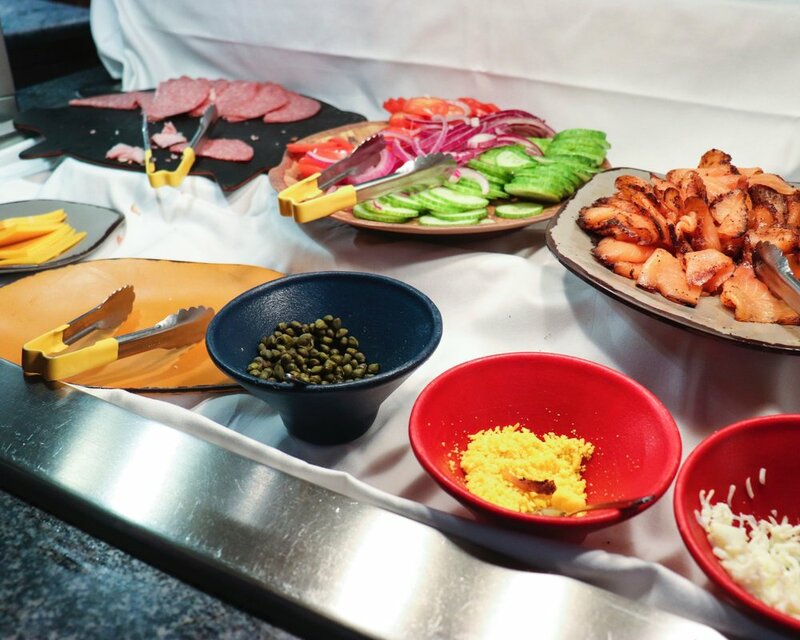 You’ll notice some more vibrant flavors dress up a typical breakfast buffet and there are some more adventurous things to try as well. Our meal began by being served Kenyan coffee and a carafe of tropical juice. (This is Andrew’s fave and he must have drank several cups!). We were then able to head up to the buffet line to help ourselves to whatever we liked. We went back a few times to try many things. Here is a peek at the variety of items on the menu. Plantains and the best tater tots. The carving station and some boboti. A variety of Omelet ingredients. Plenty of carb-y goodness such as muffins, croissants, pastries, bagels, etc. The food was all fresh and constantly refilled. One exception to this was when Andrew grabbed some fresh cut ham. It was way over done and very dry. The server asked why he hadn’t eaten it when she came to get the empty plates and we explained why. One of the chefs came out a few minutes later with a new piece of much improved meat. We chalked it up to just one bad piece as this was the only thing that didn’t hit the spot. 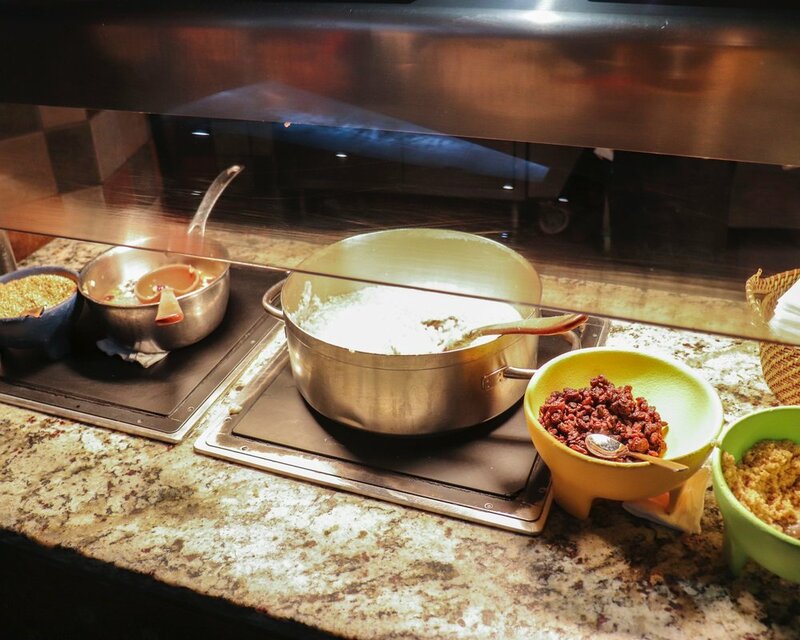 As with any buffet, the service is what it is since guests are responsible for getting their own food. For this particular meal, our server was just ok, not terrible, not great. It was busy so we had to wait a little longer than we should have for drink refills and other requests. Also, our used dishes stacked up quite a bit. We were two at a four top table so we had enough room, but had there been four of us, the used dishes would have been an issue. However, our server was very friendly. Andrew loves his Boma juice. Check out that Simba waffle! Thank goodness for good coffee! We really like the fact that there are some unusual dishes to try and we make sure to go in hungry to try a bit of everything! 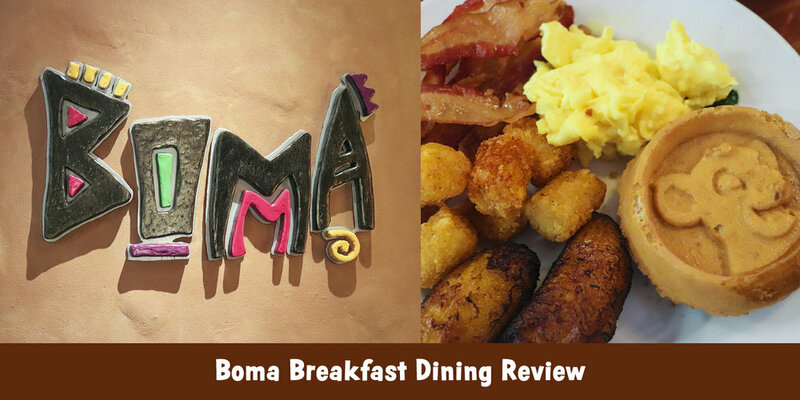 We highly recommend eating at Boma and not only would we eat breakfast here again, but we look forward to trying dinner. 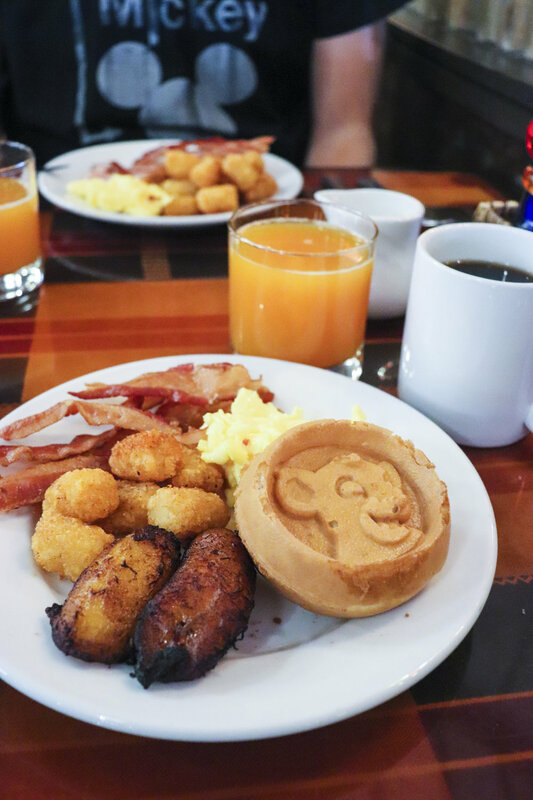 We feel really good knowing that our Disney Vacation Club home resort has a couple outstanding sit down dining options (such as Jiko) along with a very good quick service option (The Mara). Even if you are not staying at the resort we think a trip over here could be warranted for a cool experience. If you stop by make sure to walk around the resort and enjoy the animal areas too! Breakfast time for these guys too. You can see so many animals at Animal Kingdom Lodge.